When their trees are bulldozed in the Amazon rainforest, young Tamarin monkey siblings Oro and Leona are separated from their family. Their subsequent journey introduces them to other endangered species including macaws, sloths, and poison dart frogs, all the while trying to keep a watchful eye out for a stalking jaguar. The result is a charming and environmentally friendly new show with a good mix of music and emotions and tropical species. The songs include In the Amazon, Nothing You Can�t Do and Let Your Colors Shine, and the script is entertaining for the entire family. 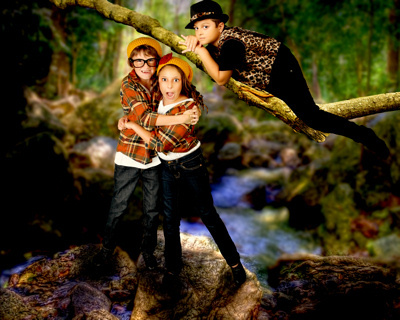 Co-creator Terri Scullin directs this journey through the rainforest filled with performers ranging from ages six to nine, and these young performers sink their teeth into this production with engaging enthusiasm. There are more than forty of them, all dressed in basic but cute and effective costumes, dancing to the catchy music with fun choreography (Sarah Brayer), all within Brett Aiken�s rainforest setting. Christopher Poulios and Tenley Stitzer star as sibling Tamarin monkeys Oro and Leona, and they do a great job trying to comfort each other through the night after being separated from their family in the haunting Lost / All Alone, as well as interacting with their fellow jungle residents with a mixture of curiosity, fun, and a bit of fear. Their fear of fellow jungle residents is highlighted by some anxiety involving a lone Jaguar who appears to be calmly following them, or stalking them, throughout. T.J. Rossi delivers a fantastic performance as the suspicious jaguar, silent through most of the show but saying loads with expressions and body language, then finally revealing his intentions with a groovy What�cha Gonna Do?. Elsewhere, Oro and Leona�s adorable Tamarin monkey family has Mama (Amanda Brown), Papa (J. Garrett Hale), and little siblings Uno (Grace Waltermire), Dos (Raegan Etnyre), Tres (Noelle Hammond) and, you guessed it, little Quatro (Vanessa Hughes) doing a nice job as a family in Just as the Rain. The energetic cast includes about a dozen poison dart frogs giving Leona both some attitude and an important message in Let Your Colors Shine, about a dozen sassy macaws teaching Oro there�s Nothing You Can�t Do complete with conga line, and about a dozen sloths calming them with a Buenas Noches / Rainforest Lullaby. The whole cast flocks together to bring the rainforest to life with the lively opening and closing In the Amazon.